Maryland‘s three best players have all struggled at various times in recent games — one might be hitting shots while the other two disappear. But on Wednesday night the Terps received double-figure scoring from each of Melo Trimble, Dez Wells, and Jake Layman, and as a result of a two-point win over Indiana, were able to move into a tie for second place in the Big Ten. The trio combined for 50 points, and did so on a highly-efficient 18-of-31 clip from the field. Granted, the Hoosiers won’t be confused with the ’85 Bears in defensive prowess anytime soon, but after a dreadful effort against Iowa on Sunday, Mark Turgeon has to be pleased with this performance. Trimble, Wells and Layman each took turns making plays on the offensive end, exhibiting why Maryland is at its best when they spread the floor offensively. Because all three have a knack for getting to the basket when things aren’t too clogged up inside, the Terps’ offense is at its best when there are abundant driving lanes. There is some size in the interior with Damonte Dodd and Jon Graham manning the post, but neither is much of a threat to score from anything other than putbacks and broken plays. The primary issue this season has occurred when Wells and Trimble get into the habit of taking too many contested twos and Layman has simply disappeared for long stretches. Last night, by contrast, they mixed things up nicely and got much better perimeter looks because the realistic threat of the drive had been established. In turn, Maryland made 10-of-21 shots from behind the arc (six from the trio) and shot 49.0 percent from the field. 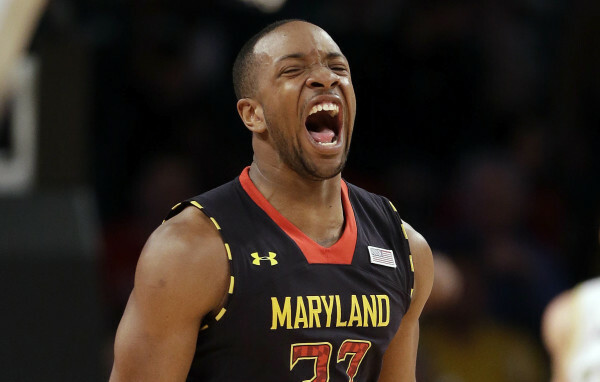 Maryland is now 9-0 when its best players reach double-figures, and the Terps have won those games by an average margin of 14.8 points. Granted, that group includes some bad non-conference competition, but it also includes wins over Arizona State, Iowa State, Purdue, Minnesota and now Indiana. Expecting freshmen like Dion Wiley and Jared Nickens to suddenly morph into major scoring threats at this point is wishful thinking, so the ultimate success of Maryland’s season will hinge on whether they can consistently play like they did against Indiana for the rest of the way. This entry was posted on Thursday, February 12th, 2015 at 2:15 pm by Brendan Brody	and is filed under big ten, microsites. Tagged: Damonte Dodd, Dez Wells, Dion Wiley, indiana, jake layman, Jared Nickens, jon graham, maryland, Melo Trimble. You can follow any responses to this entry through the RSS 2.0 feed. You can leave a response, or trackback from your own site.